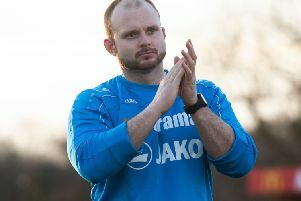 Hemel Town manager Dean Brennan was left seething at a ‘diabolical’ refereeing display which he felt was a major factor in his side dropping two points in a 1-1 draw at Hayes & Yeading on Saturday. The Tudors were made to battle back from a goal behind at half-time and earned a share of the spoils through Jamie Slabber’s 50th minute header. However, Brennan was less than impressed by referee Ben Cooke, who he felt ‘lost total control’ during a feisty game at York Road. Speaking after the game, Brennan told the Gazette: “I’m trying to bite my tongue really but I have to say that today I saw the worst refereeing performance that I’ve seen for a long time. “They scored from two, maybe three fouls in one incident on Dennis Oli, when they broke down the other end and scored. You either book Dennis Oli for diving, or you give a foul against them and a yellow card. “I’m not a referee at the end of the day, but he has contributed to us not getting the three points today. I think he lost total control of the game, and I think three of four of their lads were lucky to stay on the pitch. I think he lost total control of the game, and I think three of four of their lads were lucky to stay on the pitch. “The standard of refereeing this year – and I’ve heard other managers say it too – has been absolutely diabolical. Diabolical. A clearly frustrated Brennan was disappointed with the manner in which his side went behind in the first half, but felt that the Tudors put in a much improved display after interval. “First half we knew they would get about us and try and put their foot in,” he said. “The first goal was important and they got it – we can’t concede goals like that because the defending was schoolboy to say the least. “The key for us was to get to the 60th minute without conceding, and that didn’t happen. But we were much better in the second half. “We basically played 4-2-4 so we were very brave, but we missed some key chances at key times. We tried to win the game and the players gave everything, but it wasn’t to be today. “Fair play to the opposition because they fight for each other and they work hard – the boy up front works his absolute socks off, but we have had chances and not taken them, and given away a stupid goal.